Sara Durghalli plants seeds with a kindergartner at Calabasas. Nassar Suleiman helps younger students work on a mosaic project. Colleges Nine and Ten are the only UC Santa Cruz colleges to sponsor an alternative spring break. Students receive two credits. In past years, they have traveled to Mexico and New Orleans to work on rebuilding projects. The last two years they worked in Live Oak. 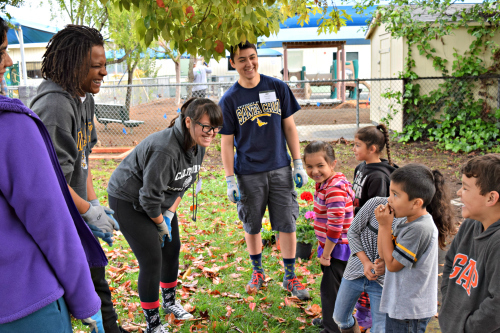 This year, under the direction of Colleges Nine and Ten Provost Flora Lu and service-learning coordinator Abbey Asher, the students are spending the week in Watsonville, getting to know the town, its people, and issues. This year’s program got started two weeks ago with a weekend get-acquainted meeting on campus with Carlos Palacios, the former Watsonville city manager and current deputy Santa Cruz County administrative officer; Consuleo Alba of Veremos Productions and founder of the Watsonville Film Festival; Maria Elena de la Garza, executive director of the Community Action Board; and Ramiro Madrano, a counselor at the Pajaro Valley Unifiied School District. Sunday, the students took a walking and driving tour to learn more about the geography, history, and politics of the south county town, ending up at the Pajaro Art Council Gallery to visit an exhibit on migration. Monday, students volunteered at Calabasas Elementary School where Lu has been working all year as part of a community partnership she established three years ago. They just beat the rain and worked on improving an outdoor learning space for kindergartners and planted pumpkin seeds along a fence. Earlier, Lu’s students in a service-learning course on environmental justice renovated a vandalized greenhouse, repaired compost bins, installed an irrigation system, and built raised vegetable beds. 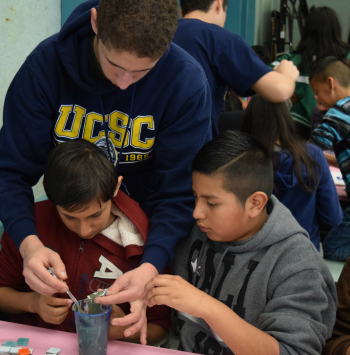 “It really empowers the connection between Watsonville and UCSC,” said Katherine Le, a first-year College Nine student from San Jose. “It’s important to be involved with the community, it’s easy to sit back and do nothing. I really encourage other students to get involved,” Le said. 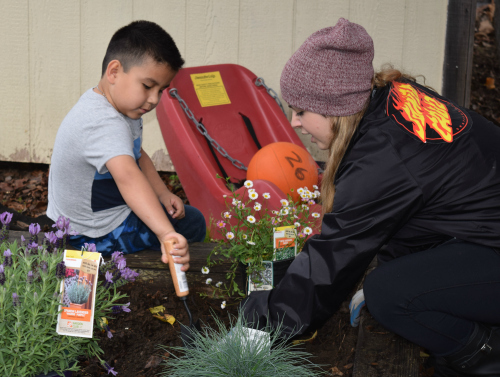 “It’s been enlightening, there are a lot of eye-opening issues going on in Watsonville,” said another first-year student, Sara Durghalli from College Ten. Today, students are scheduled to work on a mural project with the Police Activities League. On Wednesday, a visit to the Second Harvest Food Bank is scheduled for the morning and a tech day for Watsonville residents with the Digital Nest is set for the afternoon. Thursday calls for learning about the Center for Farm Worker Families and then hosting a flea market for farm worker families. For the past three months, the College Nine and Ten students, along with Life Long Learners, have been gathering clothing and household goods for the families. The program concludes with a final project due in two weeks that consists of either an essay on what they’ve learned through the service-learning experience or an art project that represents their experience along with a short written reflection.